Sumabe® Bilberry 5000 is made from a little blue berry that is related to blueberries and cranberries. Bilberry is a powerful anti-inflammatory. The herb is also a powerful antioxidant and has glucoquinine (lowers blood sugar levels). Bilberry contains flavonoids called anthocyanosides that protect the collagen structures in the blood vessels of the eye. Bilberry is used to treat eye problems such as Macular Degeneration, diabetic neuropathy, and/or cataracts. It is used to treat diaorrhea, vericose veins, and mucous membrane inflammation. The herb is beneficial in the treatment of hardening of the arteries (atherosclerosis) and in eye health.This herb may also help night vision. During World War II, British Pilots ate bilberry jam before going out on night flights. They claimed it improved their vision. It is believed that the bilberry herb helps the eyes to adjust to changes in light quickly. This is one of the greatest benefits of bilberry and can be very beneficial for ones eyes according to many studies.In Europe it is used to treat venous insufficiency- a condition that causes swelling and varicose veins. It further relieves pain and itching, and it also. Helps combat skin ulcers on the legs. Reynaud's disease may benefit from bilberry. Reynauds causes pain and numbness in the outer extremities (fingers, toes and nose) when cold. Bilberry improves circulation and makes artery walls. The herb may reduce inflammation, ease gastro-intestinal problems, and gum problems that have been linked to heart disease. Diarrhea and mouth sores can benefit from Bilberry as well. Bilberry has strong antiseptic properties, relieves peptic ulcers, diabetes, fibrocystic diseases, and painful menstruation. Because of Bilberry's strong antioxidant composition, the herb makes an excellent free radical scavenger, which helps combat the cell damage that leads to premature aging and disease. The most noted benefit that we briefly discussed above, is its ability to treat a range of problems relating to ones eye health. For example, the herb protects collagen structures in the blood vessels of the eyes, thus promoting healthy capillaries that carry many vital nutrients, such as oxygen-rich blood to your eye muscles.Various Studies have confirmed that the benefits of bilberry go even further than one might be aware of. The herb can be useful for protecting against macular degeneration, cataracts, night blindness, and poor or fading vision. 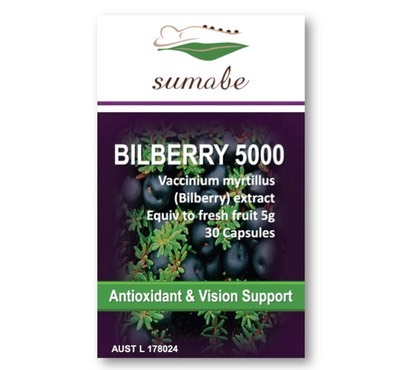 We believe bilberry to be one of the best herbs available for the protection of ones eyes health. Clinical studies have even shown that if given orally to healthy people, it improves visual accuracy. Our conclusion is that everyone should consider consuming bilberry as it helps as part of an overall maintenance of ones health.Other benefits ofbilberry include treating menstrual cramps and helping aid stomach ulcers. Varicose veins, thrombosis, angina, and poor circulation may also be improved with the use of bilberry, as the herb helps with healthy blood flow.Our last point to note is that bilberry contains a substance called glucoquinine, which has the ability to lower ones blood sugar levels significantly and its antioxidant, anthocyanin, within the herb itself, can reduce high blood pressure. Some side effects related to the use of Bilberry, include the possibility of: stomach upset, dizziness, or headache. It could cause diarrhea, and thin out blood. Caution should be used as bilberry could interfere with medications. However, there are no known adverse interactions with prescription drugs, or have there been any harmful effects noted in the literature for this herb to the best of our knowledge. As always, though, use your common sense when taking nutritional supplements: if you notice any unwanted side effects, discontinue usage, or reduce your dosage level straight away. Remember to always consult with a qualified physician before beginning supplementation of any kind.Pregnant or nursing women should always refrain from supplementation with nutritional products until they speak with their personal doctor. The evidence for bilberry's benefits as a herb are long, varied, and shown in many clinical trails when it comes to treating eye disorders and maintaining clear vision in healthy individuals. However, many of the recent beneficial discoveries need further study in our opinions to validate the benefits further. Among these new findings are bilberry's benefits for menstrual cramps and helping treat stomach ulcers. Because of the many benefits of bilberry, along with more or less unknown adverse side effects, we would say it is a supplement well worth checking out especially since there is a lack of side effects of bilberry - unlike many other herbs on the market.